Glad you tried the inhaler! Take care of yourself....asthma can sometimes be unpredictable. The yo-yos are gorgeous sewn down like this. Will have to give that a try sometime. 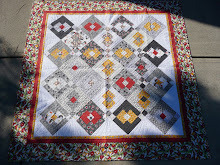 Love the yo yo quilt it is darling. Love that Bubba keg. How many ounces is it. I'm suppose to drink 75 ounces a day. So far it isn't happening. But part of that can be water out of food. You know fruit, veggies, still never was a water drinker and am trying. I love how you did up the yo yos, that is a beautiful piece. That is how I felt today, after trudging through woods for 6 miles, think I am getting too old for that kind of hike, lol. Hope you feel better soon. Sorry to hear you've felt poorly. Hope this week has you feeling in the pink. Love the larger yo yo's. glad your feeling better...ah yes I have what for years they call asthmatic cough or prenatal asthma as that is when it started for me. annoying isn't it? I Love your little yo yo quilt I may have to go buy the big yoyo maker and make a little quilt like this too for my wall of little quilts one day! Gosh, that's not feeling good thing is a bummer. Especially when it's to the point where you're thinking "ER." Glad you worked it out though. Sheesh. Love those big yoyo's. Very cool. Fun. Your big yo yos are beautiful! I'm glad that your asthma inhaler made you feel better. Tea is good! Love all of your yo-yos. You and Kristie need to form yoyo's annonymous. like the blanket stitch you did around your yo-yos. i'll have to try that sometime. Sorry you were not feeling very good but hope your are now. Your yo-yos and wonderful and your added touch by using a blanket stitch sets them off! Looked at your large Yo-yo quilt "beautiful"!! I am new at your blog and became a follower. I will visit you again soon. Hope that you are feeling better! My Michael has ashtma (SP?) He uses an inhaler daily and one for emergencies. Like you he coughs. Our air quality has been crummy in this heat. Take care!